Unfortunately there is a bug in the FTP functionality of Windows 7/Windows 8/IE11 (wininet) that makes it impossible to successfully upload files with Windows built-in FTP. Note that this is not an issue of WYSIWYG Web Builder! Microsoft has released a buggy version of the new browser that overwrites standard Windows functionality that was previously working correctly. Not only WYSIWYG Web Builder is affected but many other software that are using the same (built-in) FTP built-in functions. Even the standard FTP utility in Windows no longer works! Of course we hope that Microsoft will quickly fix this issue but in the meantime we have released an update (9.1.2 or newer/8.5.9) for WYSIWYG Web Builder. 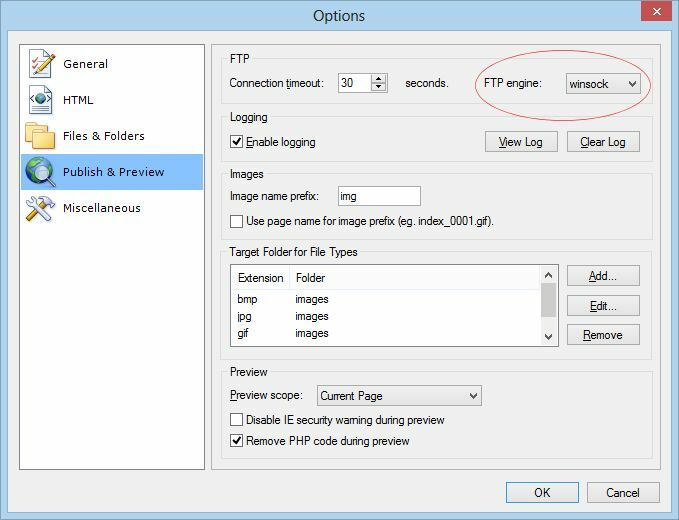 This will bypass the standard FTP functionality of Windows (wininet) and WYSIWYG Web Builder will use 'winsock' for the FTP communication instead. Also note that you can always publish to your local disk first. Note that older versions (7.x, 6x, 5,x 4.x) are no longer updated because these versions were built with a different programming environment that is no longer supported by the supplier. In the meantime several other software developers have reported the same issues on Microsoft Connect. Microsoft has acknowledged the problem and is working on a fix.